Will A Home Automation System Increase the Value Of Your Home? As one would expect with the increase of population to the San Diego area, the local real estate market is on a huge upswing, with home sales increased by more than 5% compared to last year. If you’re one of the thousands of homeowners in the area looking to sell your home this year, you’re researching ways to increase the value of your home or make it more appealing to new and prior homeowners. In your research you may have come across how homeowners are increasing the value of their homes by installing whole home automation systems and home theater systems. The questions is, does having a home automation system or home theater system really add value & appeal to your home? Here’s what you need to know. If you’re unfamiliar with home automation, here’s the quick run down: a home automation system allows you to use and control your home appliances & devices remotely. So you can be in your bedroom or living room and control your TV, thermostat, lights, door locks, home security system, audio video system, window shades, garage door and more — all through an easy to use app on your phone, tablet or PC. Home automation also allows you to program your devices to turn on, turn off or make certain adjustments throughout the day automatically according to a set schedule. When you have a home automation system in your home, you offer potential buyers a way to visualize themselves living in your home. 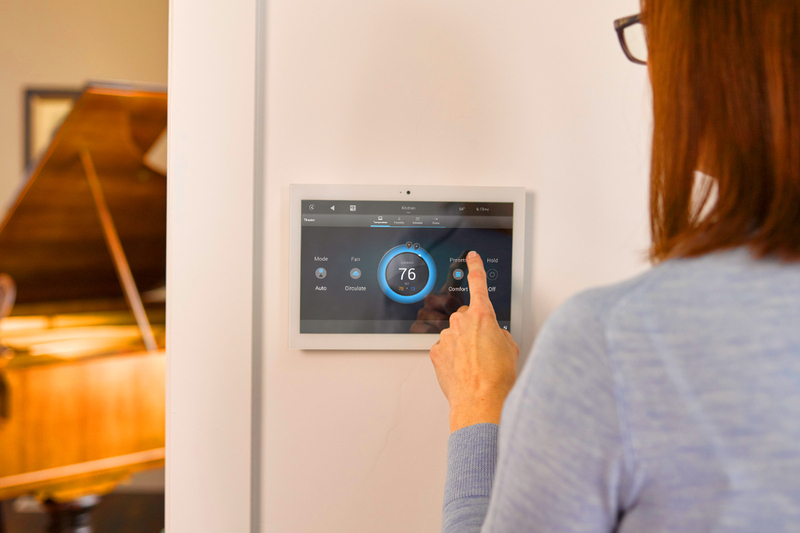 Buyers imagine themselves having control and using the system: turning on/off lights, adjusting the thermostat, playing their favorite music throughout their home, etc. It’s a unique experience that not many other homes can offer, which can dramatically increase the appeal of your home. Increasing appeal is one thing, but when it comes down to the actual value of your home can home automation and home theaters help you get more out of your home? The answer is YES. Some figures we’ve seen estimate that it can increase the value by 3-7% or more in some areas. This will obviously vary depending on location and the makeup of the rest of your home, but adding a home automation system can only add value under the right circumstances. Why does it increase value? First of all, especially for new home buyers, home automation & home theater systems are highly desirable and instantly gives your home and advantage over homes that don’t. Reliance on technology is increasing, especially among the millenial crop of home buyers and there is no doubt that having a home automation and/or home theater system is going to put you close to the top of their list. Second, home automation is a technology that is not going away any time soon, meaning it’s a relatively permanent investment that will only continue to improve, unlike other things you can try to do to increase the value of your home. This also means that regardless if you’re selling your home this year, next year or 2 years from now, a home automation system helps “future-proof” your ability to sell your home later on. So whether you’re looking to sell your home in the country’s Finest City and move to greener pastures now or some time in the future, installing a home automation system is a great way to maximize the return on your investment and plan for your next great adventure. For more tips on how to get started with home automation or building a home theater, feel free to give us a call — we’ll be happy to help.